Thompson preferred a simple two cylinder design instead of Gresley's three cylinder designs and rebuilt or planned to rebuild a number of locomotive types. The K4s were no exception, and the first outline drawing for a two cylinder rebuild appeared in February 1945, and incorporated a shortened B1 boiler. A rebuilding order for one locomotive was issued in March, and No. 3445 MacCailin Mor was rebuilt and returned to service in December 1945. In January 1946, coal consumption trials were performed against a J39 by hauling coal trains between New England and Ferme Park. Neither engine was worked to capacity, but the K1/1 was deemed to have a greater reserve of power. The K1/1 was considered a good replacement for the J39 although its wheelbase was considered long for a 50ft turntable. The capacity of K1/1's 3,500 gallon tender was recognised as a restriction, but a larger 4,300 gallon tender would have lengthened the locomotive further. The double swing link pony truck on the original K4 was replaced with a spring side control pony truck as used on the K5 and the Stanier O6 2-8-0s. 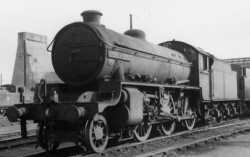 The cylinders were of a standard Thompson design as used on his B1 4-6-0s. The shortened boiler actually started life as a B1 Diagram 100A boiler that was cut down to become a prototype of the new Diagram 116 boiler. The original K4 cab was retained although the sides were altered to fit the new running plate. No further K4s were rebuilt and the rebuild programme was officially cancelled in February 1949. No. 3445 was initially classified as K1, although it was then reclassified as class K1/1 ready for the arrival of production engines. An order for seventy production engines was placed in July 1947 with the North British Locomotive Co., although authority was only received in October 1947. The locomotives were built between 1949 and 1950, and incorporated a number of changes made by Peppercorn who was now the CME. The most visible change was that the running plate was cut away in front of the cylinders to improve access to the steam chests. The firebox was also fitted with a rocking grate and hopper ashpan, and the larger 4,200 gallon tenders were provided. The K1s kept the double swing link pony truck, but the laminated bearing springs on these trucks were replaced with helical springs. This was due to problems seen on the laminated bearing springs used in the double swing link pony trucks then being fitted to the V2s. The K1/1 prototype kept its laminated bearing springs throughout its life. Self cleaning apparatus was provided in the smokebox, but this proved detrimental to steaming. The North Eastern (NE) region K1s had their blastpipe tops reduced in diameter to 4.75in (from 5.125in) and reduced in height by 2in, to counteract this. The K1/1 was originally based at New England and operated services usually operated by K2s and K3s. After a number of allocations to the Edinburgh area as well as New England, it moved to Fort William in 1954 where it remained until its withdrawal in June 1961. The order for seventy K1s was intended to be split between the North Eastern and Eastern Regions. All were delivered to the Eastfield shed where they were run-in before being allocated further south. Many of the NE K1s would often be seen as far north as Edinburgh, and early on they were regularly used on the West Highland line. Later allocations were to the Eastern Region with a significant allocation to March. Used throughout the former LNER network, the K1s proved to be very versatile and worked everything from the lighter coal trains through to express passenger services. Ahead of withdrawals, the K1s started to move away from the GE (Great Eastern) Region in 1958, and by the end of 1961 only eight remained at March. These were moved to Doncaster and Retford by mid-1962, and withdrawals started a few months later. During the 1960s, the K1s tended to take over the work of withdrawn locomotives such as the colliery trains previously hauled by J26s, J27s, and J39s. Withdrawals continued throughout the 1960s, and the last K1 was withdrawn in 1967. This last locomotive (No. 62005) served as an emergency boiler at the ICI North Tees Port Clarence works in early 1968, and has since survived into preservation. Most of the K1/1's technical details matched those of the later K1s, however it weighed slightly more. The K1/1 weighed 66 tons 17cwt and had a maximum axle load of 19tons 14cwt. Heating Surface: Total: 1708 sq.ft. No. 62005 was the last K1 withdrawn, in December 1967. This was the last operating steam engine on the Eastern Region, and had already acquired some fame for the various steam specials it had already hauled. Initially it was moved to the ICI North Tees, where it operated for 6 weeks as a temporary stationary boiler due to a breakdown at the Port Clarence Plant. After repairs were made, No. 62005 was put into storage at Neville Hill whilst a decision was made as to whether to use its boiler as a replacement for the boiler on the preserved K4 No. 3442 The Great Marquess. This would have resulted in the scrapping of No. 62005, so it was purchased by the 45428 Stanier Class 5 Locomotive Society Ltd to avoid this possibility. They then donated No. 62005 to the North Eastern Locomotive Preservation Group (NELPG). After restoration to running condition, the NELPG moved No. 62005 to its current home on the North Yorkshire Moors Railway. In recent years, No. 62005 has been in running condition and is a regular visitor to other railways and often hauls services on the West Highland Line to Mallaig. As of Winter 2005/6, No. 62005 is undergoing an overhaul which includes significant boiler repairs. The NELPG is treating the overhaul as their highest priority and hope to have No. 62005 running on the mainline for the Summer 2006 season. DMR produces 4mm scale kits of both the Thompson K1/1 and the Peppercorn K1. Nu-Cast produce a 4mm scale kit of the Peppercorn K1. The Right Price Railway Company and Meteor Models produce 7mm (O gauge) scale kits of the K1. DMR also have a kit of the K1/1. The only K1 to be given a name was Thompson's K1/1 No. 3445. Thanks to Paul Rope for the photograph of the preserved No. 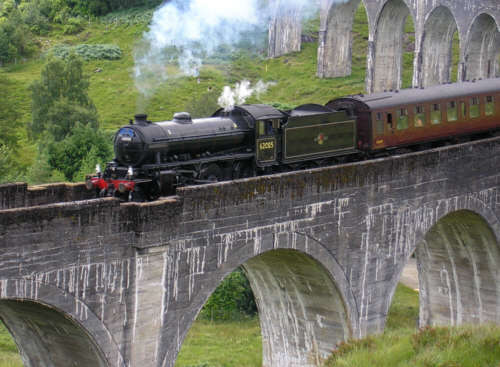 62005 on Glenfinnan Viaduct in 2005. Thank you to the P.H. Groom collection for permission to use the above photographs of Class K1/1 BR No. 61997 'MacCailin Mor' at Eastfield, and Class K1 BR No. 62008 at Heaton. Thank you to the Mike Morant Collection for the photograph of Peppercorn K1 No. 62014 at Sheffield.